I revamped this fabric table in this unique upcycled furniture project! 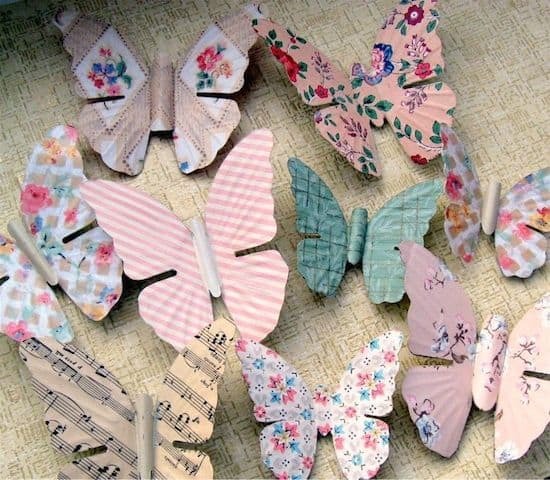 Learn how to do it yourself with Mod Podge. So easy! I love a good upcycled furniture project! I'm please to share the results of my “fabric table” makeover with you today. Call me the DIY queen! I'm kidding, but I am pleased with the results. This upcycled table is colorful like I am (kind way of saying goofball), and I absolutely love the owl fabric I Mod Podged to the top. I'd like to walk you through this fabric table re-do because, if you are afraid of doing this to a piece on your own, you won't be afraid after this upcycled furniture tutorial. There are several steps, but if you have patience and give yourself the time to complete the project, you are going to have fun and love the results. As usual, let's jump in. You first need to prepare your fabric. Do this by washing and drying it, then ironing it flat. Lay it out on a surface like wax paper and then spread a medium layer of Mod Podge across the top. Coat the entire top, covering an area of fabric with Mod Podge slightly larger than your tabletop. Allow to dry. Measure your tabletop and then cut the fabric to fit. You'll see that the fabric can be cut without fraying since you Mod Podged it. Cool, huh? Set the fabric aside. Coat the tabletop with the color of your choice. Keep this in mind – you will likely see the color of the tabletop through the fabric, which is why I chose this light blue. It was the same color as my fabric background, and I thought it would bring out the blue in my fabric nicely. If you have a dark fabric with a light pattern, just stick with white as your background. I painted my entire tabletop and then let it dry. While my tabletop was drying, I painted the legs with Lavender. I sort of have ADHD. Completely coat the legs and allow to dry. This is a great way to clean up an edge. Simply line with stencil or painter's tape and then paint with your color (in my case Titanium White). Peel the tape away immediately and you'll have a nice, clean edge. Allow to dry. Turn the table over and paint the base (right underneath the top) with the color of your choice. I used Ocean Cruise. Completely cover and then allow to dry. I'm going to be honest, this part was a blast. I made black stripes around the edge of the tabletop. As you'll notice, there is no method to my madness, and I didn't tape. If you don't feel like you want to risk going freehand, simply use your stencil or painter's tape to section off stripes and paint that way. Peel the tape away immediately and then allow to dry. Look at my painted table with the checks around the top. I'm so happy! I know it's taken awhile, but we've finally gotten to the best part – bust out the Podge, my friends! I thought I was going to use Matte, but at the last minute I switched to Gloss. Grab your fabric from the first part of this project and lay it down on the tabletop. I did one side of the top and then the other. I literally poured out Mod Podge onto the tabletop and started spreading, making sure that I had a medium layer of glue. I then laid the fabric down over the Mod Podge, making sure I was getting my placement correct, and then I flipped up the other side of the fabric and repeated. You might feel like you are putting too much Mod Podge under the fabric, but you are better off to put too much than not enough. Smooth the fabric down thoroughly with your hands. Remove as many of the bubbles as you can. Work from the center out towards the edges. I had some Podge squeeze out the edges. Just wipe it away with your brush. This is where the brayer comes in handy. You don't have to, but I highly recommend it. Keep rolling the brayer over the fabric and smoothing it until you are satisfied. Wipe away any Mod Podge that comes out the sides. Allow this fabric to dry. Tip: If you find that your fabric goes over the edges a little bit, I would use an X-Acto knife to trim. Be very careful! 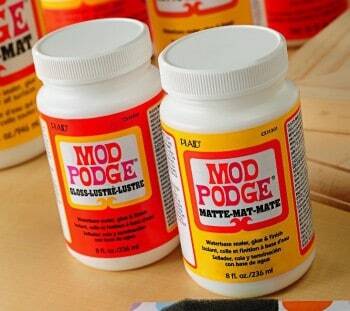 Coat the entire tabletop with Mod Podge. Don't do the rest of the table yet. On the base of the table I added some flower decorations (pulled from the pattern on the fabric) using a smaller brush and my Citrus Green/Kelly Green. You might have to coat the flowers a few times depending on the colors you select. Go around the entire table base with your flower patterns. Don't be too hard on yourself about how these look – they are supposed to be loose and whimsical. Dot the centers of your flowers with the opposite color on the end of your paint brush. Allow to dry. I used my liner brush to add some stems to the flowers with Asphaltum. Allow to dry. 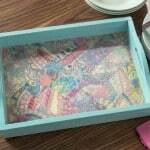 Decoupage the entire fabric table with a medium coat of Mod Podge – allow to dry and then repeat. Your upcycled furniture project is nearly complete! Your choice of final finish can be Gloss or Matte with a clear acrylic sealer, or you can use Hard Coat for a more durable, satin finish. I'm very happy with my attempt at upcycled furniture, and the bright and cheery color palette makes me happy. 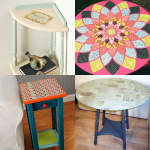 Now you are ready to try a fabric table re-do of your very own! This is really cute! I love the colors and fabric you chose! Hi…can you please come REDO my whole house!!! So cute, I love it! Love it! Nice combo of colors and fabric! I’m learning so much reading your blog! Thank You! I love this whimsical look! And what a great large project. Lots of impact. Great job! Yay, Yay, Yay!!! I love seeing painted projects like this!!! Wasn’t it fun? It turned out too cute – just like you! Cute table redo…love that fabric! beautiful – colors are great – thanks for the steps! That is so super cute. I’ve got to learn more about this mod podge stuff. This table is the best ever!! I have a table in my basement that I picked up at a garage sale one year and was just getting ready to toss it out next week. NO WAY!! Oh I am so excited at the possibilities. All I need now is some super cute fabric. Your table is so dang stinkin cute!! Thanks for posting this. I have yet to try MP with fabric. Why? I don’t know. But if the Queen of DIY does it, I, a lowly Mod Podge peasant can surely try! This turned out so great! Totally Cute! I too love that owl fabric. I’ve been hanging on to it for the right project. I might have to copy your idea and use it for a table! As always, it’s a pleasure to read your blog!!! Great job, Amy! It turned out fabulous:) I’ve been wanting to try that fabric MP for a while now- maybe I’ll go out and get some- you are so inspiring!! The owl fabric is adorable. What a fun project, and you did an awesome job. 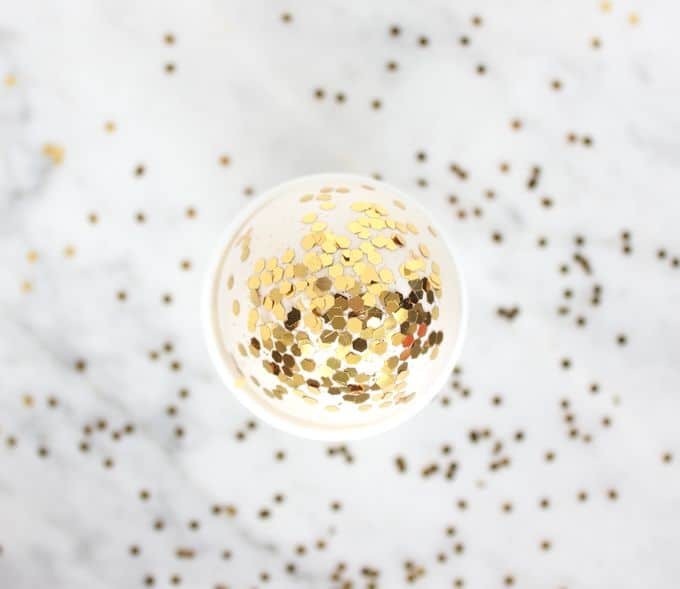 I soooooooooooooooooo love this – I am looking at an ugly old high school desk and am thinking this is what I need to do to make it look nice. LOOOOVE the owls Amy! nice! love it! that owl fabric is great! Your owl table is such a hoot! I like your whole art deco look. If you decide to give this beautiful table away, my daughter’s sorority’s mascot is….the owl! Thanks for your continued inspiration…. Thanks for sharing the comment about applying the Mod Podge before you cut your fabric. We will definitely be using this trick to prevent fraying. What an awesome project! It’s so fun and whimsical! LOVE LOVE LOVE! I’m looking for a table for my kitchen/dinette and think I will end up doing something like this too. Now just to find the fabric and paints…. What a fun whimsical project. The black and white touches and the purple legs take this cute and trendsetting table to over the top design. Love it. Oh man, this is the best furniture redo I have ever seen. I have been sitting on my kids’ dresser for months now, not totally sure what I wanted to do after I finished all the sanding and priming. This is awesome. Thanks for opening my eyes to such a super cool idea. 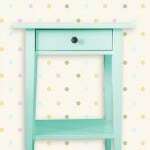 Very cute…now I’m plotting on my son’s nursery dresser. I’m thinking of doing an orange/blue combo. Amy! It’s been a while and I’m so glad you linked up to the Project Parade! Hurray! I love your creativity and this is no exception. Great job as usual, girl! 😉 I might even have a tutorial for you! I am SO doing this! You make it look fun and EASY!! I love it. Love the great colors! What a makeover! If you would ever like new recipes or would like to be featured than please come on over to our blog and please check us out! We also have a give away going on right now and a apron going up tomorrow!! yah. thanks for letting me stop by your blog. Cute table… I love the colors you chose. It’s So Very AMY. You did a great job. I love the black on the table edge. So whimsical. Wow! Great idea! I love the owl fabric and had no idea that there was such a thing as FABRIC MOD PODGE!! just gorgeous, what a great idea, and a great colour! Can Modge Podge be used to fill the ‘grooves’ in paneling? I’m wanting to cover the back of a bookshelf with fabric, but it has grooves in it, like paneling. It’s made of laminate. Thanks! Hi Lynn! No, you would need to use something like wood filler. Thanks!